... then how does one explain the continuing humanitarian crises in Dar-fur, Congo, and Iraq? ...does that mean that in order for the UN to be effective, it has to turn a blind eye to the apparent hegemony that is practiced by some countries because they happen to be the major resource providers for the UN? US Ambassador to UN, Susan Rice : "There will be more perpetrators...more victims. But we must work to ensure that there will also be more justice and fewer and fewer bystanders." Do you see future UN interventions as necessary, viable, and justifiable? "...the international community has an obligation to intervene—if necessary, and as a last resort, with military force." "Almost" as if the international community comprises of the few great powers to "intervene" as and when they desire. 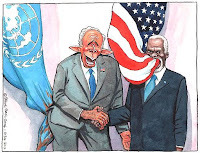 Hard to trust the UN at face value, really! Good point! 'Necessary'...yes; 'viable'...unfortunately not; 'justifiable'... yes. In all this the 'good is oft interred with the bones'...there are so many UN organizations that work relentlessly all over the globe for the upliftment of downtrodden! People who are critical of the UN overlook the vast good that is done by it. Stop questioning the validity of the UN. It does more good than you can imagine. I have to agree that the UN has many organs within it that have no agenda besides "the upliftment of the downtrodden". 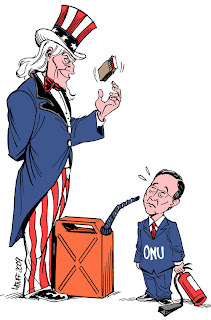 However, there is some validity in the argument that sometimes it isn't really the UN intervening, but in fact "the major resource providers for the UN". Yet, the majority of the world looks at the UN and only sees the high-profile organ known as the Security Council. And looking at the flaws seen in the gridlock caused by the veto powers of the permament members, the structure and guidelines of the UN Security Council is definitely brought into question. Nevertheless, we mustn't use broad brush strokes when depicting the UN; the Security Council is only one organ of the UN, and the entire UN does indeed do a great deal of good around the world. If the "international community" alludes to the US (which it erroneously often does- US is very isolated country right now), and it's stooges, then the answer is an emphatic no. I thinks for this kind of stuff words are not enough.